AI has left nothing untouched since its inception. The latest and most important of the industries to employ AI consulting is healthcare and lifestyle. It has taken the task to make you healthier by providing you real-time lifestyle assistance. AI has changed the lazy attitude of people and made them health conscious. A few years ago no one would take care of their health unless otherwise knocked down by the disease. Nowadays AI has simplified the whole procedure that has made people more careful about their health. AI bridges the gap between an individual and his physiological state by capturing, storing and processing the physiological and general health information of an individual. It draws conclusions by processing the data, updates a user about his current state and provides him useful health tips. If you are hearing such a thing about AI for the first time, you surely not follow AI technology closely. You still can understand AI`s assistance for a healthier lifestyle. I tell you how. Some things have become the habit you do continuously without caring much about consequences. Every evening you go out to dine a tasty food, you remain in your office seated for the almost whole day, inactivity has become your habit, and on that sugar is your favorite. Do you know the impact of all that? It cannot be a healthier lifestyle. But who would tell you that, ever wondered? Artificial Intelligence has advanced. It can tell you what`s right for you and what`s wrong. What can have a negative impact on your health? To keep your lifestyle healthy AI consulting has become indispensable. It can make you follow a healthier lifestyle by updating you on your present state of health. It can notify you when you`re consuming more sugar than healthy to recommend less consumption. Or recommend exercise when you remain sedentary. How AI does that is not complex to understand. You may already have some notion about how AI does the predictive analytics. AI/ Machine learning consulting tracks your actions, records your habits, recognized underlying patterns of your lifestyle and based on that offers you recommendations and suggestions. Any health issue it detects it notifies you. That gives you fair time to act beforehand. Is not that remarkable achievement of AI? The only thing that Artificial Intelligence uses to render such a service is data. AI utilizes user-generated data and converts it with the algorithm process into simple health tips. Those tips do you two ways good. Firstly it informs you about ailments and secondly improves your health condition. The most commonly used gadget AI uses for data generation is a smartphone. Over the last few years, smartphone users have skyrocketed that make it best platform wherefrom AI can execute its services for a better and healthier lifestyle. The sensors smartphones come embedded with make data generation possible. These sensors monitor a user’s behavior and record even a minor change in user behavior. After processing these behavioral changes, AI reveals the underlying illnesses, mental as well as physical, a user may be suffering. Be it food you eat frequently, the time you sleep, amount of physical exercise you do, the smartphone presents every such information about the user in a well-integrated manner. Top machine learning companies have successfully developed AI enabled devices that not only track the user`s physical activity but data related to physiology as well. These come in the form of wearable devices. The sensors these devices have on them are in direct contact with the body and track the positions of your body. In short, AI is acting as your virtual health assistant. Point to say is all that data AI generates is used to keep you and your lifestyle healthy. On the more general healthcare level, it has revolutionized the way doctors and hospitals treat people. They employ AI on a grand scale. With the advent of AI healthcare has improved a lot and the expenditure, too, has gone down. It has brought the following remarkable changes in the healthcare sector. In the case of diagnosing the patient or, you know how important for a doctor is a patient`s history, treatment history, the diagnosis other doctors have made, and other such data. AI keeps track of such information not passively but actively analyses it to understand or figure out the underlying repetition in the pattern. The information that AI comes up with is then used by the doctor to make a better diagnose or treatment. AI cannot only cure but prevent as well. By reminding people of exercise, consume nutritional food; take medicine on time, do away with stress, these reminders can go a long way to make our lifestyle healthier. The user’s interaction with AI and knowing about various health conditions they are going through became possible only with AI gathering information from a person by way of sensors. Now people can check blood pressure and measure heart rate in the comfort of home via a smartphone. Even there is such a thing also where AI is employed to do a test on a urine sample. It saves time and money. Sometimes a patient has a minor illness and yet has to travel to the hospital for treatment. But AI has done away with such practice as it allows treatment of such patients remotely by making use of biological sensors. Detection of deadly diseases has to be early, once late nothing could be done to evade the fate. A study has shown that AI detects 30-times-faster these deadly diseases but does so with an accuracy of 99 percent. However that said, it does in no way mean that doctors have become irrelevant. AI will only assist by providing them your data. It would enable them to make for you a personalized treatment and diagnosis. So what AI has done in healthcare is the utilization of untapped data for proper medication and therapy. This is only one of the possible set of AI applications in our lifestyle. Artificial intelligence companies have even made found the way out to help improve sales of your business using AI Consulting. It is true that AI was earlier deployed to assist in other domains such as business, transportation and other such domains where automation was possible. But its application in the healthcare sector is only recent, and in such a short period AI has revolutionized the domain. It has brought speed, efficiency, and reduced expenditure. 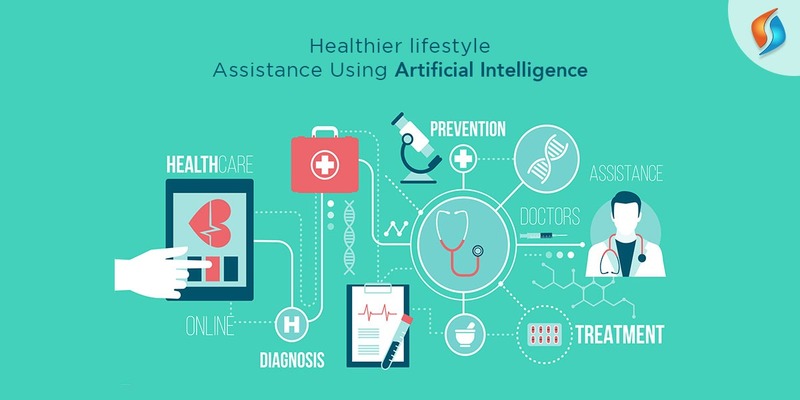 In short, AI has become an integral part of the whole process of the health care system, providing users with real-time updates and notifications on pressing issues and helping them maintain a healthier lifestyle. The assistance of AI has become indispensable.